HorseLoverZ.com has the largest selection of western horse tack for sale online. Western saddles, Western tack or Western bits are all parts of the Western horse riding setup. 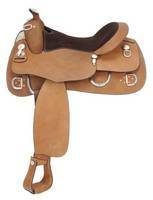 Western saddles come in styles from barrel racing, trail or endurance. Western tack includes equipment like bridles or headstalls, Western saddle pads, hackamores or western reins. Western bits come in a multitude of styles like Western snaffle bits, Western Roller or Western Dogbone bits to suit the particular needs of the horse or rider. Western saddles, Western tack or Western bits are available from top brands like Tough-1 or Abetta. All our Western tack come with the HorseLoverz 100% Satisfaction Guarantee. If you are looking for western tack and equipment, you've come to the right place! Western saddles, Western tack or Western bits are all parts of the Western horse riding setup. Western saddles come in styles from barrel racing, trail or endurance. Western tack includes equipment like bridles or headstalls, Western saddle pads, hackamores or western reins. Western bits come in a multitude of styles like Western snaffle bits, Western Roller or Western Dogbone bits to suit the particular needs of the horse or rider. Western saddles, Western tack or Western bits are available from top brands like Tough-1 or Abetta. All our Western tack come with the HorseLoverz 100% Satisfaction Guarantee.